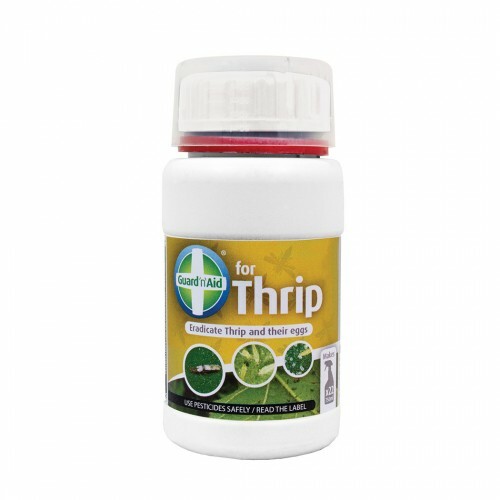 Guard N Aid For Thrips is perfect for edible and non-edible crops a contact insecticide that quickly acts against larval stages, adult stages and eggs. Working in both indoor and outdoor applications, including hard surfaces – due to been Pyrethrum based. Pyrethrum is an oil based natural insecticide which has been used for centuries made from dried flower heads from the Chrysanthemum plant. It destroys and targets the nervous and respiratory organs of insects – and is extremely safe to use around food. How To Use : Mix Guard N Aid for Thrips with 15ml per litre of water (do not exceed 20ml per litre) in a suitable sprayer, shake well until thoroughly mixed and use within 6 hours of mixing.